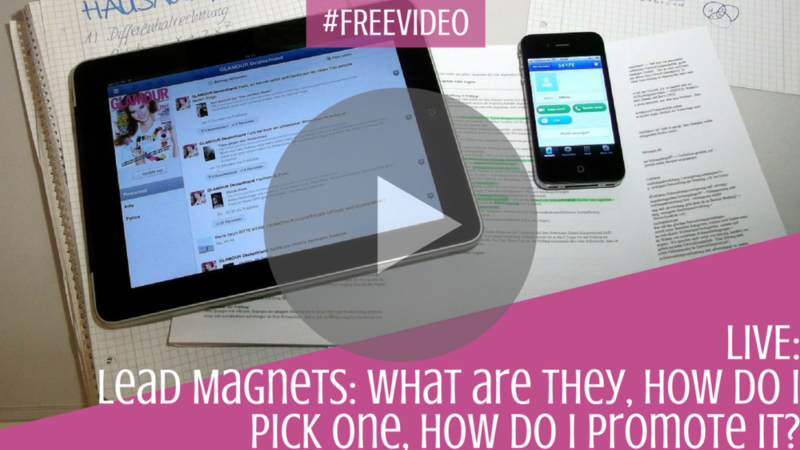 Today’s live stream I answered your question: What Is a Lead Magnet? Not only that, I gave you some tips on how to figure out what to offer so you can add targeted readers to your list. I also gave you some ideas on how to promote your lead magnet once it’s complete. There’s a few things that I mentioned in the video including my Create Alluring Lead Magnets content upgrade that I put together for my readers a few months ago. It’s the perfect tool to have in your arsenal if you want to build that email list. You’ll also find a handful of different ideas of what I use as lead magnets and content upgrades over on my freebies page. Watch the video to hear my hint on how to figure out the lead magnet even if you don’t have anything (or much) to sell right now. If you’d rather, click here to watch it on Facebook. The first few seconds were a little choppy because of the weak connection, but it was smooth sailing after that. What the hell are Lead Magnets? Do you want to check out all the live videos I’ve been doing this month? I’m there every week day answering the questions that you guys have been asking me the most. Join me live each morning to ask your questions, or pop a post on my Facebook page if there’s something you’ve been hoping I’d cover.